Intel leaked a bit of its future plans to battle the ARM-based mobile chipsets onslaught. It knows that it has mostly lost the battle, when it comes to iOS or Android, despite the Honeycomb tablets with Oak Trail chipsets it demoed recently, so the hopes are now pinned on its current stronghold - Windows. Bill Kircos, Intel's director of product and technology media relations, revealed that an upcoming Atom Cloverview processor platform, called Clover Trail, will be introduced around the time Windows 8 is ready for the mass market, which should be in the Spring of next year. Windows 8 tablets will thus be able to take advantage of a faster and more power-efficient chipset from Intel than the current crop, since Clover Trail will be produced with the 32nm technology. As a comparison, the current ARM-based Tegra 2 chipset, that is in most Android Honeycomb tablets, is done with the 40nm process, and Apple's A5 with the 45nm. The die shrink means more transistors can be fit in the same place, or the same oomph derived from a much smaller footprint, resulting in better performance and battery life. A true system-on-a-chip, like those above based on ARM's designs, has much more to it than the manufacturing process, though, so we'll see what Intel has in store for Windows 8 tablets, and if it will be better than the ARM-based designs at the time, like the quad-core NVIDIA Kal-El chipset. One advantage is certain for Intel, though - its chipsets are x86-based, which means that you will be able to run legacy Windows programs on the Win 8 tablets with Intel inside, unlike on those with ARM-based silicon, and that might make all the difference in the world, especially for enterprise customers. Next year it might turn out that the WinTel era is far from over, despite the claims that we live in a post-PC world. I suspect Intel would be better served if theyvrelease a chipset that is optimized for Android. Windows is a bit late to the party. Correction... they release :-) typing too fast. Well, after windows 8 there would be no need for Android for tablets I believe.. seeing as Windows 8 is compatible with everything that currently exists.. Right.... Lets all just hold our breath and wait for MS to roll out Windows 8. By the time that Windows 8 rolls around, Android will be at 50 to 60 percent of the tablet market. 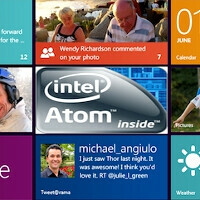 Do you honestly think that everyone is going to just dump their Android tablet for a WIntel device? Yes.. because Windows supports everything that exists - and since it does - and it can even run Android va bluestacks - there is 0 reason to buy anything else.. unless you're an Apple addict - which most people are not. i thought that in the last article MS said that you cant run legacy products on it? Did that change? Man i hope so! If they can make it smooth like a tablet but be able to run legacy windows programs on there (at least the important ones at minimum) they will have a real shot of taking a fat chunk of ipads and honeycomb. They did make it smooth like a tablet. Watch the video from D9: http://www.youtube.com/watch?v=R8klHxUoFds As for legacy support - you saw that it's still Windows - they showed you the desktop even. That means that you can still run MS office and all the other stuff - just like on Windows 7 - via the "Desktop" App. They only thing that is of concern to me is battery life.. but I'm sure that MS - as well as the manufacturers - will deliver on that. Now - all we need is just Windows 8 - and an Eee pad transformer-like device - and there is absolutely no need for neither a laptop, a netbook, or a dedicated tablet.